Plague is a dangerous and deadly bacterial infection with a short incubation period. In the Middle Ages, plague is estimated to have wiped out 40 percent to 60 percent of the people in Europe and other areas. Rats, mice, Guinea pigs and other small rodents can carry the plague, but it’s important to understand the details before panicking over whether your little critter is a walking plague-machine. Medicinal science has come a long way since the Middle Ages. The word “plague” refers to a collection of maladies related to the bacteria Yersinia pestis. Bubonic plague is just one bracket of this sickness, affecting the lymph nodes of the patient. The Black Death, famous for obliterating much of the world’s population between 1340 and 1400, was largely abBubonic plague infection. Other plagues include Septicemic plague, of the blood, and pneumonic plague, of the lungs. Cases of plague are rare in the United States, but the disease still pops up from time to time. Unlike pneumonic plague, which can be spread from human to human, bubonic plague is primarily spread through fleabites. If a flea takes up residence on an infected animal and then bites a human, that human is at risk of developing the bubonic plague. It should be noted that it is possible to become infected with plague by simply handling an afflicted animal, though these cases are rare. Initial symptoms include chills, fever, headache, swollen lymph nodes and muscle pain. Can Guinea Pigs Get Plague? Guinea pigs, like rats, dogs, cats, mice and other small animals, are susceptible to Yersinia pestis and thus the plague. If one animal is infected with the plague and that animal’s fleas bite another animal, the second animal could become infected. Guinea pigs can develop the bubonic plague if they are infected by the flea bite of a flea that has fed upon an infected animal. Once a Gunnea pig is infected, it can pass the infection on in the same manner. No vaccine against plagues exists in any form, though researchers continue to work toward one. In 2006 a group of scientists developed a plague vaccine that prevented three-fourths of its test group, composed of Guniea pigs, to survive the pneumonic plague, but a plague shot isn’t something your vet is likely to have on his or her shelf. 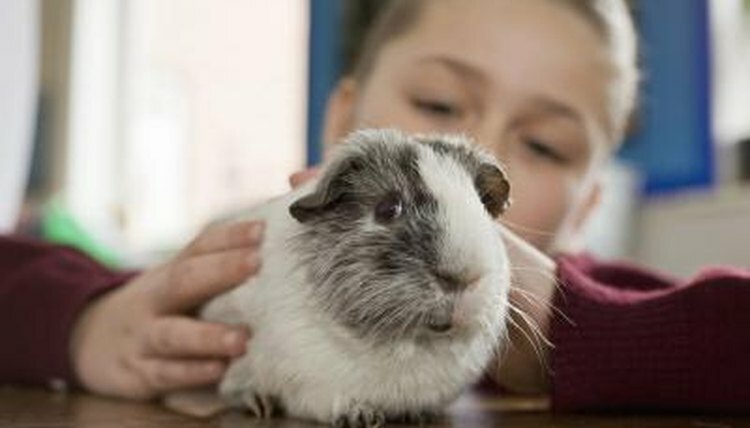 The best prevention is keeping fleas away from your Guinea pig by ensuring he lives in a clean, safe area away from the ground, and giving him a bath with a flea shampoo should any fleas show up. It’s important to note that bubonic plague cannot manifest out of thin air -- your Guinea pig will carry it only if he is exposed to other infected animals. As always, if your Guinea pig is acting strange or showing symptoms of illness, a trip to the vet is in order.